Recent strong winds blew remaining leaves off the tress near my house. The air was filled with multi-colored leaves that swirled all around me. It was a sight to behold! This photo shows leaves filling the sky as the wind blew them high above the tree tops. I can't say that I've seen this happen before. This moment would have been so easy to miss. In photography, timing can often be everything. Dirt roads are entirely underrated. They are usually free of heavy traffic, they can lead to unexpected finds and are relaxing to navigate. Unlike asphalt, traces are left from every creature who crossed your path. I like to think of it as a cross-species journal of sorts, entries are left in the form of foot prints. This photo was taken at Franklin Farm as the sun was setting over the ridge. Walking distance from the silos shown in the last post, this shot was taken later the same week. Sunset during fall often provides softer light with hints of graduated colors. 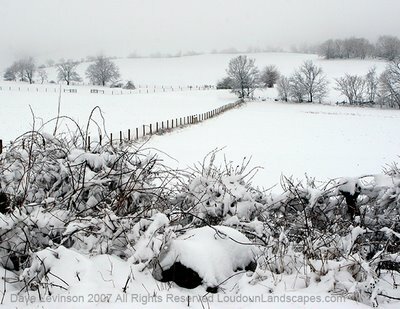 Loudoun experienced first snow fall of the 07-08 season on Thursday morning. Driving along Route 601 from Clarke to Loudoun county was a bit of a white out. Nothing stuck, but what a sight to see in early November. Old handmade items have a certain allure. In this day and age of franchises and homogenous products, human effort starkly stands out as something to behold. This rocker rests on the porch of a civil war era home. If only we could hear the stories it could tell. In Round Hill last night there was an event to raise money for the Arts Center. Hosted in the middle of town, folks came from all over to place bids on fine art, eat fine food and listen to the Woodshedders (a terrific local band). Yours truly played bartender at the event. A truly enjoyable small town affair. Loudoun finally received rain last night, it's been quite a dry spell. I found this Lilly sitting in a secluded pond off Williams Gap Road this morning. A wet, half mile hike across a pasture revealed this hidden place at the base of the Blue Ridge. The fair scenes in Loudoun and Clarke counties are always the genuine article. They are generally not too commercial while revealing rural lifestyles in a public way. 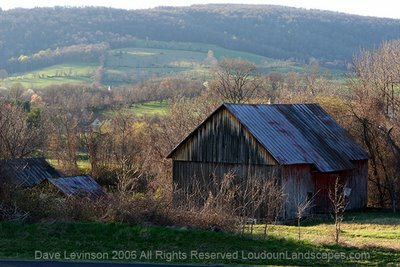 While struggling to retain it's historic identity, the Loudoun fairgrounds were encircled by land moving machines seen atop nearby hills. I'm not sure if this chick won a prize or not. This chick holds all the prizes. She was kind enough to pose for the camera. ....and this is after. Some might think this is a photo of the parking lot at Reston Town Center. The smash-up derby here is likely a safer place. Which one is not like the others? The baby goats were adorable. My daughter and I recently visited the Elizabeth Mills Riverfront Park along the Potomac. Located in the Landsdown neighborhood along side the golf course, this 122 acre park is an interesting find. The initial part of the park allows you to explore on the banks of the Potomac river. The balance of the park comprised of a trail than runs adjacent to the river. A nice hidden gem to be explored. Many thanks to the Washington Post and their newly launched LoudounExtra.com website for hosting this blog. My Pastoral site is listed under the Blogs section. Thanks!!! Update: Jan 2011: The Washington Post updated this site and no longer features a blogroll list. If you happen to be in northern Virginia in July, stop by the Round Hill Arts Center to see my latest work. This solo show opens on Thursday, June 28 through the end of July. The pieces in this show are a result of my late excursions across the expansive dirt road network and pastures of the area. Many of the photos feature vistas that have since been developed. Sping has sprung once again in western Loudoun. Leaf buds have started to unfurl and the songs of birds fill the air. Spring is definately my favorite time of the year. 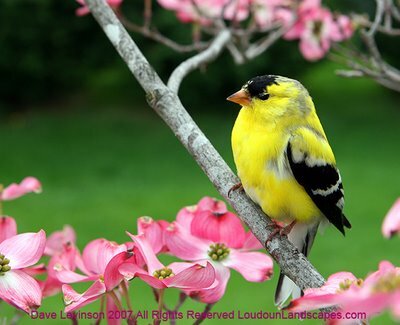 This little yellow finch sits atop a Dogwood sporting bright pink blossoms. The colors have returned! Spring has sprung in Loudoun, no more snow pictures for now. The tulips have sprung, the field grasses are growing long and the geese will be leaving soon. The entire countryside is transforming from brown to green and the emerald is shines once again. I can't think of another place I'd rather experience this transformation. 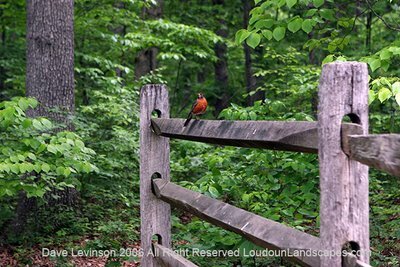 Loudoun County offers incredible vistas filled with meandering lines, pleasing natural shapes and fences that draw the eye to infinity. However, scenes like this aren't revealed to the casual traveler. Exploration is often half the fun in Landscape Photography. I'm now quite the expert on the dirt road network of this county. 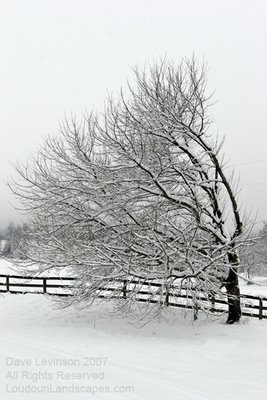 Snow does amazing things to the landscape. It can shift the entire mood of a scene in just an hour. Some words that come to mind are peaceful, tranquil and serene. 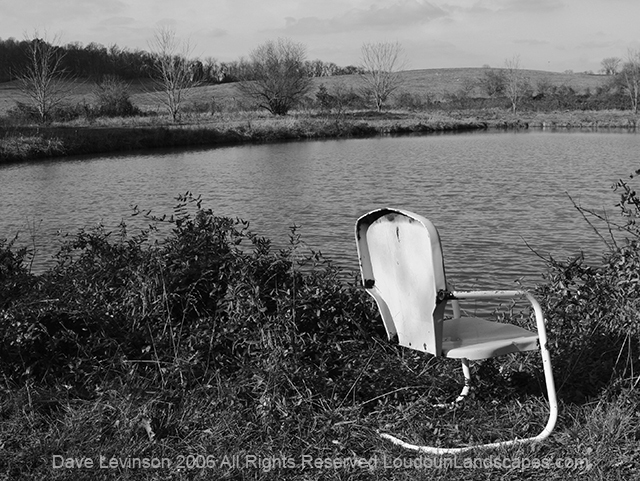 I attended a showing of "Crazy Like a Fox" last night, a film shot mostly in Loudoun county. This movie portays a seven-generation family forced out of their farm by mounting debt. It was an emotional expererience for me because I often discover abandonded farms while hiking through the county. Old barns become more than icons of the past upon inspection; horse worn floors, hand made iron latches, generational additions, handcut boards, rusted toys. Western Loudoun received five inches of snow this morning, which doesn't seem to bother the animals. These neighbors go about their business as if neither existed. They sure do have a pretty back yard. 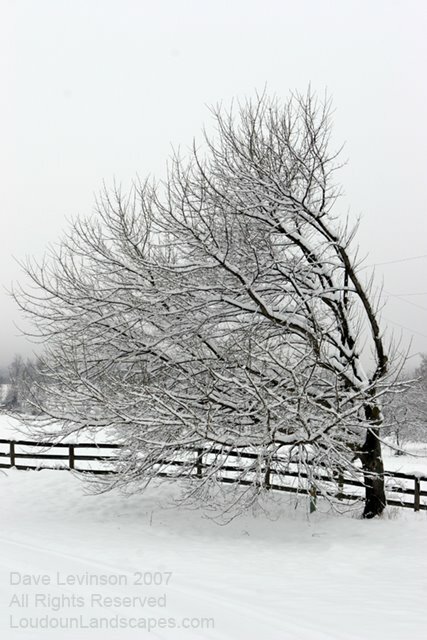 After weeks of summer-like weather this winter, the expected feel of the season has finally arrived. 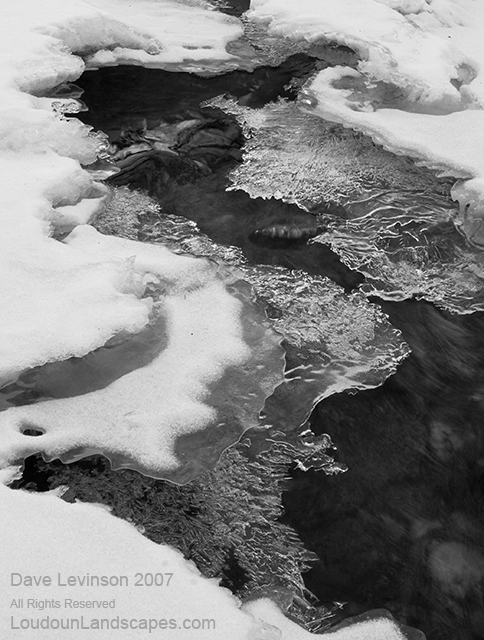 Patterns found in this partially frozen creek tell a story of decreasing water flow coupled with daily thawing. The patterns left behind reveal layers of delicate ice that impossibly hover over chilly black water flowing millimeters beneath. Many Loudouner's are unaware that just over the ridge lies a sprawling and peaceful monastery. Along the Shenandoah river on the north side of Route 7, you will find the Clarke County Monastery. This tranquil place is partially open to the public. Various homemade products and religious literature can be purchased in the welcome center. This photo was taken on the west side of the property, just off the beaten path (as you would expect from this blog). When driving into Round Hill from the east, you will often see Turkey Vultures perched in one of the largest trees in town. There can be upward of fifty of these large birds looking over as you drive by (all hoping you drive into the ditch, I'm sure). Pictured here are roughly twenty five vultures, though some are obscured by the thick branches. 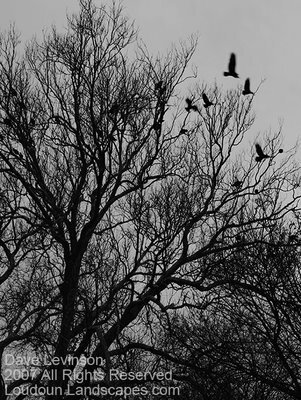 Many more flew away upon my approach. In light of the Spring we're having in the middle of January, I thought this photo of a robin would be appropriate. 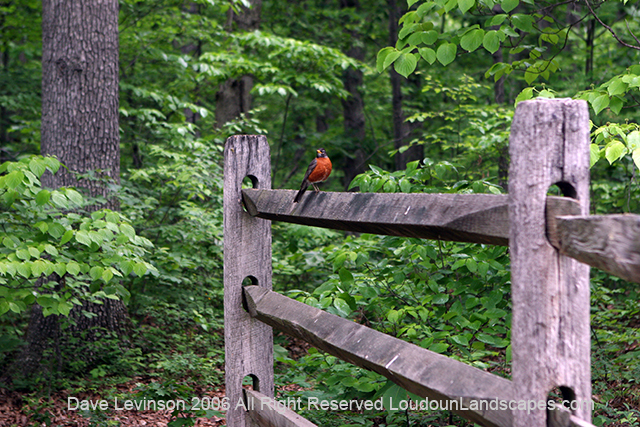 This Loudoun bird was taken at Balls Bluff historical park located north of Leesburg. I'm pretty sure it let me get close expecting to be fed, but alas, I only had camera.